A peer who was jailed last month for 12 weeks for sending and receiving text messages while driving on the M1 has been released by the Court of Appeal. Lord Ahmed, 51, had been involved in a fatal crash minutes after sending the messages on Christmas Day 2007. He hit a stationary car in the outside lane of the M1, killing Martyn Gombar, 28, from Leigh, Greater Manchester. The Appeal Court suspended his sentence because of "exceptional" mitigation relating to his community work. Lord Ahmed served 16 days of his sentence. Road safety charity Brake said it was "appalled" by the decision. The peer had been jailed at Sheffield Crown Court after admitting dangerous driving. Lord Ahmed was freed from Doncaster Prison on Thursday following the completion of formalities in the wake of the ruling. 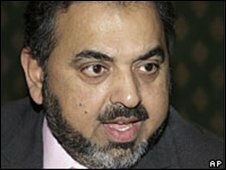 Lord Ahmed was a Labour life peer until his conviction last month, when he was told he faced expulsion from the party. The crash happened near junction 35 of the southbound carriageway, at Rotherham. The peer sent and received a series of five text messages while driving in the dark along a 17-mile stretch of the motorway. He was not present for the ruling by three judges in London. He had been due to be released on 20 March. Allowing Lord Ahmed's sentence appeal, Lady Justice Hallett said that in the court's view, the sentencing judge had had "no option but to impose a custodial sentence". Lord Ahmed's use of the mobile phone, in the dark on a motorway, had "put people's lives at risk and for no good reason". But because of the "exceptional" personal mitigation in his case, Lady Justice Hallett said the court was able to take the step of suspending the sentence for 12 months. Lord Ahmed's barrister, Jeremy Baker QC, had argued the jail sentence could "irreparably and permanently" damage Lord Ahmed's ability to carry out community work in the future. Before the collision with Lord Ahmed, Mr Gombar, who was Slovakian, had crashed into the central reservation, leaving his Audi facing the wrong way in the third lane of the motorway. Lady Justice Hallett said there was "little or nothing" Lord Ahmed could have done to avoid the collision. She said he had never been accused of, or admitted, causing death by dangerous driving. The road safety charity Brake said it was "appalled" at the decision to free Lord Ahmed. A spokesman said: "Driving is one of the most dangerous things that most of us do on a daily basis. It requires complete concentration and both hands on the wheel. "To take your hands off the wheel to send a text is outrageous and completely unacceptable."